Around the time we first got into the likes of Miranda and later celebrated Vicious, friends of ours had recommended that we also try watching Black Books given its similar comedic tone. But one thing led to another and we didn't find the time to watch it until recently. Ironically we had managed to watch the entire run of The IT Crowd before Black Books despite having related creative minds behind both shows. But once we finally sat down to watch the show we were laughing constantly at its subtle yet brilliant humor and its excellent use of proper build-up for a good gag delivered as a visual punchline at the end of the episode. These days you may see this sort of thing once or twice in a season but for this show it was something they aspired to do in each and every episode. But like many great British comedies, the show had very short "seasons" to use American terminology and a total run that feels briefer than we'd like it to be. But it just goes to show how good writing can only go so far and there's a certain prudence in knowing when to quit while you're ahead. And thus the definitely ends on a high note. 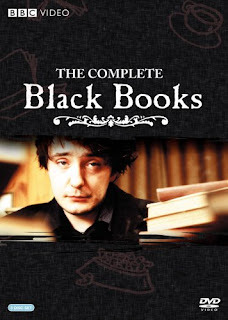 Synopsis: Black Books is a British comedy series created by Dylan Moran and Graham Linehan and ran for three series. Across its run it won numerous awards including two BAFTA awards for Best Situational Comedy. Bernard Black (Dylan Moran) is the owner-operator of Black Books, a small bookshop. The main quirk is that he's terribly anti-social and is often hostile towards his own customers. His only friend is Fran (Tamsin Greig), who runs a sort of curio shop next door with random items of all sorts. In the first episode we are introduced to Manny (Bill Bailey), an unhappy accountant who is dealing with a lot of stress. By the end of the episode he becomes a shop assistant helping Bernard with the shop. The stories mostly take place in the shop with the antics of Bernard mistreating customers while Manny tries to actually do a good job and make the place profitable. But it's hard to do that when you have Bernard and Fran constantly smoking and drinking to excess and with Manny quick to get distracted by this or that initiative. But with every situation they all get into, the stories become more and more absurd and ultimately hilarious. What I Liked: The show is amazingly funny, period. The humor is subtle at first and you can easily believe that it only involves quick puns and physical comedy. But then over time even the small one-off jokes turn out to be a foreshadowing of something else and the final payoff is always satisfying. How they managed this so consistently says a lot of the cleverness of the writing and we're all the better for it. The trio of Moran, Bailey, and Greig playing Bernard, Manny and Fran made for a great trio and a wonderful core cast to tell a wide range of stories. Across the series nothing ever really seems to faze them and they just roll with the punches of what life (or in this case the writers) have to offer them. And the whole experience remains quite hilarious. What Could Have Been Better: The show is not about realism and its comedy often relies on people doing ridiculous things that they would never do in real life. This is a minor criticism and it's not like Black Books is the only comedy that has ever utilisized absurdity in this manner and it won't be the last. But I can see how some folks might try to use ths against them. Then there's the reminder that not every episode is as brilliant as we'd like it to be. Most are awesome and hilarious with a clever joke at the to wrap things up. But some felt a little forced or the humor somewhat drier than desired. But not all of them are winners. TL;DR: Obviously my efforts and finding something to criticize about this show was rather lacking as I love the show too much from start to finish. I guess it may be one off those comedies that you'll either find tremendously funny or terribly dull depending on whether you appreciate it's brand of humor. But for me it still gets a full 5 crazy things Bernard does to customers in the shop out of a possible 5.